How do banks calculate your personal loan eligibility? Learn about the basic calculations banks use to determine whether you are eligible for a personal loan or not. All banks, before they give you any kind of a loan, check whether you have the capacity to repay – after which they will figure out if you are eligible for their loan or not. So, how do they decide on your loan eligibility? There are several criteria they consider, but most importantly they use some basic calculations to determine whether you have the financial capability to repay the loan. You can also check your personal loan eligibility by making use of personal loan eligibility calculators which are available for free online. By calculating the IIR, the banks determine your repaying capacity. It is based on the understanding that the loan value does not to exceed your repaying capacity. The ratio is usually 33% to 40% of your monthly income. The banks use the IIR to decide on the loan amount and the repayment amount. While deciding your loan eligibility, the banks use FOIR to determine if you have any other loans that you are repaying. FOIR is the most popular calculation used by the banks to decide whether you have the income capacity to repay the loan. This calculation is used by banks to determine your eligibility for home loans. Here, to decide the loan amount, the value of the property is considered. However, to determine your repayment capacity, your income is considered. While most of the banks and NBFCs offer personal loans, you can avoid unnecessary visits to the banks and rush around the documentation by using MoneyTap, the fastest and the simplest way to apply for a personal loan. To avoid getting your application rejected, you need to meet certain parameters of eligibility and documentation. Above 23 years and below 55 years. In-hand salary of ₹ 20,000/month. With a minimum monthly salary of ₹ 20,000. Professionals, such as doctors, lawyers, shop owners, business owners, etc. with a minimum income of ₹ 20,000. Non-Eligible: Manual labourers, Skilled labourers, Tea stall/Juice/Paan/Butcher shop owners, Caretakers, Loco Pilots, Drivers, Lab Attendants, Hawaldars, Sepoys, Constables, Office Assistants, Property Dealers, Travel Agents, Insurance Agents, Contractors, Astrologers, Yoga/Gym Instructors, Priests, Field Sales Executives and Pawn Brokers. Should be in the same job for 6 months and overall work experience of 2 years. Should be in the business for a minimum of 3 years with work experience of 3 years. Ahmedabad, Anand, Bangalore, Chennai, Chandigarh, Coimbatore, Delhi, Gandhinagar, Hyderabad, Indore, Jaipur, Mumbai, Mohali, NCR, Panchkula, Pune, Rajkot, Secunderabad, Surat, Vadodara, Vijayawada, Vizag. 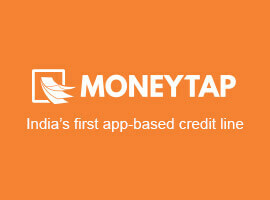 Get quick cash loans with MoneyTap's line of credit.